MicroSD Round Up – Reviews and Giveaways! Earlier, we introduced the technology terms of the MicroSD cards. From the technology terms itself, we know that not all microSD cards are made equal, as such their performance can vary. In this round up, we will be looking at the performance of each individual microSD card from various manufacturers that we could get our hands upon, and we will have them benched marked. The tests were conducted on the ASUS UX302LG with Samsung EVO SSD as the work horse, and the cards connected to the system via Transcend RDF8 (Firmware TS22) connected via USB 3.0, h2testw 1.4 and CrystalDiskMark v3.0.3 x64. Fake SanDisk Ultra UHS-I (64GB 8GB) with Fake Samsung Evo Sample ?? As far as we try to find out and mention their manufacturing technologies, not every card’s Nand chipset can be found, unfortunately. Determining the best card in terms of raw speed, we are using the Sequential results from CrystalMarkDisk, which brings the similar result and test as that of the H2testW or if you attempted to copy a (large) file to and fro a memory card. In the conclusion, we will be highlighting the best microSD card as well as the best microSD for mobile use. To determine the best card for use in mobile, we will be looking at 4K and 4K QD32 results. What is the difference though? For sequential, the software reads/writes whatever file size you choose when you start the test sequentially. That is to say it starts writing on a sector and then writes the next part on the adjacent sector and so on. On the other hand, 512K, 4K read/writes to random sectors on the drive, but it reads/writes 512KB or 4KB of data at a random point, then moves to the next random point. For the QD32, it is similar to 4K but there are more requests for the data sent to the memory card to make it a tad more busy and stressed. As such, the 4K random read/write results would best mimic a card in a mobile device environment. Check out over the coming days and weeks for our individual benchmarks and for our conclusion! Now, for the best part of this post, we have a 64GB microSD card to giveaway. How to participate? Throughout the period of the reviews, all you have to do is just either comment your experience with the card that is being reviewed if you own one, or drop us a BBM with an image of your largest or fastest microSD card! Editor’s note: We have corrected the post to reflect that Lexar is using MLC nand throughout all of their microSD cards, rather than TLC. We apologize for the initial error. Got myself a few 64 GB SanDisk Ultra from yours truly and so far, haven’t had any problems with them. All my videos and mp3s plays without any lags or problems. Used them on my BlackBerry Z10, Q10, Z30 and Samsung Galaxy Note 10.1 LTE (GT-N8020) So satisfied with it that I would gladly recommend them to anyone who would want to try it. Awesome!!! Thanks for the review!! Really help us to find out more on the products as well as the individual performance before getting the products!!! Thumbs up and looking forward to more reviews!! Wow, looks good, when will we know the conclusive end test results? Hey guys, fantastic review and really helpful stats provided! I’ve looked through quite a few of them but couldn’t find any relevant info to answer the following question: What’s the card you’d recommend for the GoPro 3+ Black edition? 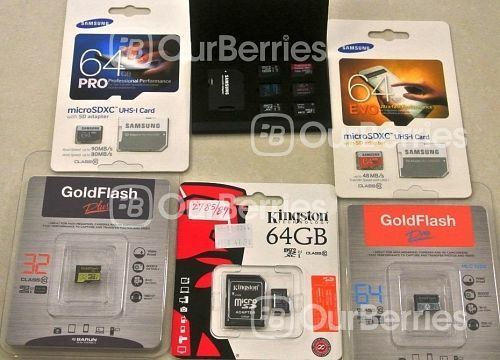 So far I’m thinking of the Samsung EVO 64GB based on what I read – do you guys agree? If you are looking at recording at its full resolution, no, we do not recommend EVO at all. Samsung Pro, Lexar High-Performance UHS-I 633x, Sony High-Speed R95 UHS-3, or Sandisk’s Extreme series. PNY can be also considered. Hi outberries team, great review and very informative.. Pls do me a favour. Help me to choose. I’m from Malaysia, and looking forward to get a 64GB microsd. I’ll be using it as an expanded storage for my macbook air by using a specifically cut-out adapter. I’ll be putting my iTunes sync folder in it, will store mainly audios and pictures. No intention to use it with camera or smartphone. Would you recommend to me which of the following I shld get? Read or write speeds matter more, in my case? Looks like the the sands ultra us-1 is among the best in my list. I’m on a budget too. The Gold Flash plus is RM40 cheaper than the sandisk ultra and its Read speed is so much faster, would this be a better choice for me? That will depend on what you really require. In your case, it seems to me that the read speed is more important than write since you will be viewing photos and listening to it more often than saving data onto it. Depending on the size of your files, if there are many small photos, then the SanDisk might suit you need better. If the photos are larger and files are roughly similar sizes of about 5-10mb, perhaps you could consider the GoldFlash Plus or Transcend premium.